Acquired by the Lakers from Golden State via trade on February 19, 2014 … Had 15 points in debut with the Lakers 2/21 vs. BOS … Totaled 17 points (6-13 FG) with two steals 2/23 vs. BKN… Recorded a career-high of 23 points with three steals 2/25 at IND … Had 14 points and 4 assists 2/26 at MEM … Finished with 14 points (set career-high with 4 3FGM) and a career-high seven rebounds 3/3 at POR … Equaled a career-high with 23 points (4-9 3FG) and four rebounds 3/4 vs. NOP … Notched 14 points with 6 assists 3/6 vs. LAC … Tied a career-high with 7 rebounds to go with 11 points 3/9 vs. OKC … Scored 16 points and matched career-high of 7 rebounds 3/13 at OKC … Recorded 13 points and a career-best 6 steals 3/19 vs. SAN … Dished 8 assists (career-high) with 8 points 3/23 vs. ORL … Tallied 18 points and 5 assists 3/25 vs. NYK … Made a career-best 9 field goals en route to 21 points with 4 assists and 3 steals 3/28 at MIN … Notched 12 points, 6 rebounds and 5 assists 3/30 vs. PHX … Recorded 17 points and 4 rebounds 4/1 vs. POR … Totaled 14 points, 7 rebounds and 6 assists 4/2 at SAC … Notched 10+ points on 20 occasions, including three games with 20+ points. Was not selected in the 2012 NBA Draft... Signed by Golden State as a free agent on July 26, 2012 ... Traded by Golden State with MarShon Brooks to the Los Angeles Lakers for Steve Blake on February 19, 2014. 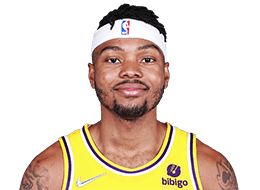 Full name is Kenneth Lamont Bazemore, Jr...Parents are Kenneth and Glynis Bazemore...Has one brother, WyKevin...At Bertie High School, averaged 18.8 points, 10.3 rebounds, 4.2 assists and 3.2 steals as a senior...Named North Carolina Coastal Conference Player of the Year as a senior and Roanoke-Chowan Player of the Year as a junior and senior...Selected to participate in the North Carolina-South Carolina All-Star Game...Averaged 22.9 points and 9.8 rebounds as a junior...Majored in human services and criminal justice at ODU...Was extremely active in Warriors community relations efforts during his rookie campaign...Made a visit to the Midnight Basketball League in San Francisco, talking to the participants of the program that serves to develop strong character traits among youth and young adults, ages 13-30...Visited the Twitter headquarters in San Francisco as part of the #GSWCountdown campaign leading up to Opening Night...Attended the NBA Nation event in San Francisco in May shortly after the Warriors were eliminated from the 2013 NBA Playoffs...This past offseason, participated on the Warriors team at the annual Madden-Mariucci Charity Bocce Ball Tournament in Livermore...Has attended numerous sessions of Warriors Basketball Camp, including one on the day in which he signed his first contract with Golden State, speaking to the kids about how work can pay off...Took part in the Back To School Rookie Reading Rally at Sobrante Park Elementary School in Oakland shortly before the beginning of his rookie season...Keeps fans updated on his activities at his website, KentBazemore20.com...Is on Twitter @KentBazemore20.